Amit Varma, Managing Partner,Quadria Capital, India. Technology-enabled healthcare has the potential to revolutionise the way people receive and manage care, by collaborating technologies, analytics and process innovation. This will drive the next wave of investment in the South East Asia region. The real value of Healthcare IT is derived only by continuous innovation in both product and service based technologies. Over the past two decades, the Southeast Asian region has witnessed rapid growth and development, making it the hot bed for global investments. Most countries have prospered and the population has benefitted from the same. However, this prosperity has not percolated across all countries and sections of the society and so is bereft of an inclusive growth model. One sector that has been directly impacted by disparate growth and income levels is the healthcare sector. In a region that shelters approximately nine per cent of the global population and is expected to have eight per cent of world’s non-communicable deaths, healthcare in the region attracts a miniscule six per cent of the global healthcare expenditure pie. Furthermore increasing population, rising incomes and increasing prevalence of chronic diseases and comorbidities have put additional pressure on region’s healthcare systems to keep pace with the demand of more reliable professional and sophisticated healthcare services. As a result, we have an ageing, under-developed and over-stretched healthcare systems in most of the Southeast Asian countries. The number of beds per 1000 people stood at 0.6 and 2.1 in Indonesia and Thailand respectively against 3.0 in the United States and the United Kingdom. The number of physicians per thousand stood at 0.3 and 0.4 in Indonesia and Thailand as compared to 2.4 each in USA and 2.7 in UK. While the region has seen an increase in investments in healthcare sector in the past few years, it is still not enough to keep up with the growing needs of a fast growing population. Much needs to be done, especially in ensuring uniform access to preventive and curative care and delivering increased value to patients at a given level of cost. As different countries try to re-structure care delivery model and promote efficient use of resources, a clear trend is pointing towards technology enabled healthcare as means to revolutionise the way people receive and manage care by collaborating technologies, analytics and process innovation. Promotion and introduction of technology in various spheres of healthcare infrastructure allows a leapfrog jump in healthcare provision for majority section of the population in an affordable and effective manner. Technology Aggregators: Delivery platforms aggregating technology to provide healthcare services. Both the above target segments are critical components of business models that will cater to the unmet demand in the most cost effective and efficient manner. Technology Principals: These constitute of manufacturers and service providers who are driven by innovation, improvisation and affordability in the medical technology space. They form a part of the US$ 4 billion medical technology industry in this region, with the 65 per cent current contribution from Malaysia, Thailand and Indonesia. While the market and its growth is dominated by MNCs, there is an encouraging contribution from local players. These local players, who are aggressively vying for a large share of this market, are supported by the market’s demand for low cost and low value products and hence will thrive on frugal innovation to achieve the aim. Most of the device companies are focused on the chronic diseases segment, led primarily by diabetes, cardiovascular diseases and cancer. Today, Asia is home to 55 per cent of the world’s diabetic population and more than 50 per cent of the global elderly population. Additionally, more than 50 per cent of deaths due to cardiovascular diseases and cancer happen in Asia. With expected increase in an ageing population and prevalence of chronic diseases the number of people affected by these diseases is bound to increase. The indigenous medical device manufacturers in this region have long focused on the low-to-mid-market segment such as the surgical glove manufacturing in Malaysia. The local manufacturers are now shifting focus from low end rubber-based products, such as gloves and catheters, to manufacturing non-rubber-based and more advanced medical devices such as diagnostic imaging equipment, orthopaedic devices and implantable devices. Additionally, with the boom in medical tourism of major surgical procedures and standard medical care soaring in the region, it will further boost the sale of medical devices. The medical devices and consumables market is expected to double to US$ 8 billion by 2017. While an increasing number of MNCs are setting up R&D and manufacturing sites, some are also going ahead and partnering with local medical technology firms. The local manufacturers, over the years, have built significant capabilities to develop innovative products. In the process, they have gained insights into customer demands and local dynamics and built efficient sourcing and distribution capabilities without increasing the overhead costs. Additionally, with better understanding and easy compliance with regulations, these firms are becoming a choice for partnering. A growing number of local manufacturers are also establishing themselves without partnering with MNCs, since they are now capable of developing products that can cater to needs of general physician as well as specialist both in urban as well as remote places. Singapore is one country that has encouraged innovation in technology through tax breaks, financing and infrastructure. On the other hand, Malaysia has created a robust eco-system for production of advanced medical products. Indonesia and Vietnam support the region with basic materials for production. As a result, the region has started attracting investments from both strategic and financial investors. In the recent past, Hong Kong based Comfort Enterprise acquired Ogawa World Berhad, a Malaysia-based medical equipment company. In March 2014, Employee Provident Fund of Malaysia acquired stake in Supermax Corporation Berhad, a Malaysian company that manufactures, distributes, and markets medical gloves. Earlier, Southern Capital Group, a Singapore PE firm has acquired Aventa Bhd for US$165 million. Other components of technology that will see a growing use are the IT enabled healthcare products and services such as Electronic Health Records (EHRs), Computerised Physician Order Entry (CPOE) and applications to manage care. Until now, IT was applied more to support the non-clinical functions such as accounting, procurement, human resources, admission, discharges, etc. However, the providers are now increasing the applications of IT across various functions, including clinical functions, due to its ability to save costs as well as improve the quality of clinical care. They also help reduce medical errors by mapping patient history with current prescriptions. These technologies also assist the physician review of the patient’s medical history and in accurately diagnosing the condition. As a result of IT applications in ancillary activities such as scheduling for doctors, staff, equipment and assets, healthcare services will transition to an online system allowing administrators to analyse various trends to minimise wastage of resources and optimise labour. The changing environment in product and service innovation, is also witnessing support from governments in terms of improved regulatory situations in the regions. In some cases, like Singapore, the government has gone ahead to set up funds to encourage growth of medical technology start-ups. The other segment of technology that is expected to attract investment is the technology aggregator space. Technology Aggregators are companies that are seeking to leverage technology to create a platform solution for healthcare delivery services. Technology aggregators, commonly referred to as e-health companies, aggregate and offer services like Emergency Medical Response Systems (EMRS), m-health, telemedicine and remote patient monitoring. Currently Asia has an average 5.9 physicians and 10 beds per 10,000 population. e-health the use of electronic processes and communication to deliver medical information, access or record data, or provide clinical services-has the potential to significantly bridge the huge gap between demand and supply of basic healthcare. The e-health industry, across the Asia Pacific region, generates a revenue of ~U$8.5 billion and this is expected to grow exponentially. Various platforms under e-health are expected to play an increasing role in delivering healthcare outside of the conventional clinical settings. These services are improving and accelerating access to care for people who otherwise might not have access to care or might have to travel to receive care. All these factors provide a strong foundation for adoption of technology by a majority of the people. 88 per cent of Southeast Asian countries reported the usage of emergency toll-free telephone services while 75 per cent of Southeast Asia uses mobile devices for emergency communications. 62 per cent of Southeast Asia reported adoption of mobile telemedicine initiatives. These numbers seem quite promising and are definitely a step in the right direction as countries try to provide better healthcare to people in this region. Amongst the various components of e-health. m-health is expected to enjoy the highest growth due to surge in usage of mobile internet and availability of inexpensive devices. But the key to its growth will lie in support from other technology-driven services. These include improved patient management systems to store and analyse patient information, improved integration between diagnostic devices and mobile phones to record and transmit data to physicians remotely and a platform that facilitates care coordination & patient engagement channels. This transition towards m-health provides an opportunity for various stake-holders, such as payers, physicians and med-tech companies to develop certain critical assets and capabilities. Med-Tech Companies: These companies are working with physicians to increase the interaction and reach of the physicians with patients. They are designing and developing less expensive devices/technology that create and deliver value for an expanded set of customers. The aim is to reduce “total cost of care” rather than trying to minimise one time transaction costs. Providers and Physicians Providers and physicians fear the risk of losing patients and revenues to the ‘out of hospital care model’. Some of them fear getting obsolete, while quite a few of them believe that integration of technology would require major changes to both infrastructure and mind-sets of physicians. • Most of these technologies don’t require significant changes in work-flow of the hospitals, apart from building a comprehensive patient management system. e-ICU, a concept that is growing particularly in India and could be extrapolated to this region, is one of the many examples of leveraging clinical expertise, processes and high-end technology for the benefit of the hospital as well as patients. In a country like India, that has more than 5 million ICU admissions every year, there are only approximately 5000 critical care physicians. An e-ICU is aimed at taking adequate critical care to patients at peripheral systems and minimising patient dislocation and disruption. The e-ICU can also train staff at peripheral care centres to treat critical patients in real-time and thereby improving critical care delivery. With most of the technology and manpower requirements standardised, an e-ICU spoke centre can be set up in less than three weeks. Hence, minimising the disruption of hospital operations. Payers: Payers have now realised that technology will drive healthcare access in this region and hence will need to tweak their business model to keep up with the change. Very few have, however, gone ahead and are in the process of altering the dynamics with both the doctors and the patients. • Another trend that might be seen in the near-term is building capabilities for technology solutions, such as m-health and tele-medicine to take on the dual role of payer and provider. With the growing potential, the e-health industry is seeing a rise in investment. In 2013, Geob International Sdn that manufactures a device that measures the skin’s humidity and temperature levels and displays the readings on the screen of the smartphone, received seed funding from Star Accelerator fund. While currently, most of the investments are happening at seed stage we do see big investments coming in to set up e-health platforms. Going forward, maximum value may be realised by understanding what the patients want and how a more seamless care experience can be delivered. With each stakeholder wanting to find a place at the table to be a part of the technology growth story, will need to focus on developing and delivering products and services that create superior health outcomes based on evidences at affordable prices. The above factors will push technology to the centre of healthcare planning in public and private sectors and therefore create greater opportunities for all stakeholders. And consequently, it augurs well for investors to focus on this segment of the healthcare market and participate in creating an inclusive growth in one of the most critical services for any society. 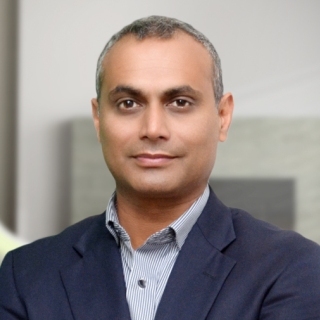 Amit Varma is the Managing Partner of Quadria Capital, a US$304 mn healthcare focused private equity fund that invests in healthcare sector across Southeast Asia. He also spearheaded India Build out Fund, US$100 mn Healthcare and Education focused domestic Private Equity Fund. Dr. Varma has Over 20 years of Private Equity, strategic & operational leadership and board level experience in healthcare organisations across USA, Asia and Australia.